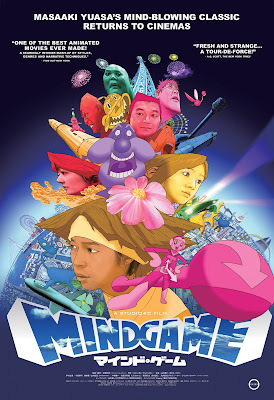 With MINDGAME finally getting a US release thanks to G-Kids I'm posting of a modified review I did many years ago for IMDB. Purely form over content anime that combines a variety of styles to tell the story(?) of a guy in love with a girl and the gangsters who chase them and the people they meet and...your guess is as good as mine since the film restarts and shifts and goes in out out of thoughts and hopes and minds. I can't describe it you really have to see it. Violent, sexually frank and with other material that people might find offensive (this would get an R rating) this is a film that's in your face and in your head. I completely understand why this film has a cult following since as an experience the film is simply overwhelming. Personally I got to a certain point and wanted to raise my hand and say I'm full now. Actually I had to go through this in pieces since it was too much.Its the sort of thing that is now readily available for people to see (I had to get a region 4 Australian DVD in order to see it) but at the same time I completely understand why it hasn't been released widely in the US and elsewhere until now, since it's a film that I think companies would have a hard time marketing with many people loving it and many more going "WTF?" Actually in saying all of that about the experience of seeing the film I haven't said how it it is--- As a movie, or as a story its a mess. Its scatter shot and rambling taking odd turns in order to come up with great sequences, many of which look great but don't hang together. Its a film that leaves the audience wondering what in the hell is going on. Is it any good? As an experience yes, its great, I mean who needs drugs? As a story its up and down. I'm mixed. That said if you want a one of a kind cinematic experience you really have to see this. MINDGAME begins it's march around the US beginning Friday. For a list of when it will be playing in what city go here.